My Little Slice of Bliss: A Love-y Anniversary Card + a WINNER! Good morning! Today is shaping up to be a fine early-summer day with temperatures predicted to hit 89F this afternoon. I think it's time for us to put in our window a/c units! OK, thanks for indulging my need for card sharing. I know that you are eager to get on to the "winner" portion of this post! 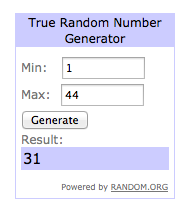 I owe you a winner for my washi tape giveaway from my May Ways With Washi feature. And here she is . . . Thank you, THANK YOU to everyone who drops by for my Ways With Washi features and graciously comments! I always have the best time reading what you write. Just gorgeous Emily!! The punch around the page makes a beautiful frame!! A perfect Anniversay card with the sweet sentiment!! Have a great warm day!! Oh, Emily, it's gorgeous! I can totally see Colleen's influence AND YET it is still all you - that is so cool :) That lace is so pretty! You CASEd Colleen's elegant style and created a gorgeous creation all your own Emily~beautiful work! Absolutely beautiful CASE, Emily! Think I better check out her gallery, too! This card is gorgeous Emily! Love that unique color palette and the added pearls are so pretty! You always create such amazing things, sweet friend! Colleen is going to love this, Emily! It's beautiful! Love the pretty pink paper and the pop of green, and the pearls! With the lace, pearls, and pretty papers, it is definitely a Colleen card. I'm sure she will love it. It's beautiful!! Emily, what a fantastic tribute to Colleen! So, so pretty!! Sorry I haven't been around to visit in a while, but I've sure enjoyed catching up with you! Absolutely gorgeous card! Love the colors and die cut used! It is certainly a style like Colleen's...so pretty and elegant!